On the hunt of my wife's ancestors or more precisely, her fathers ancestors. She always thought that he came from Sussex, but the reality is that the Mills family were Wiltshire born and bred for generations. I did not spot a grave in the church yard that had any link whatsoever with the family. But it is a beautiful church, quite dark inside. My flash had failed hence the shaky photographs. There is also a handstitched map of Little Bedwyn, destined to become a piece of local history. There was a notice on door that told us to leave the door open as swallows had nested in the entrance porch. A History of Little Bedwyn can be found here. 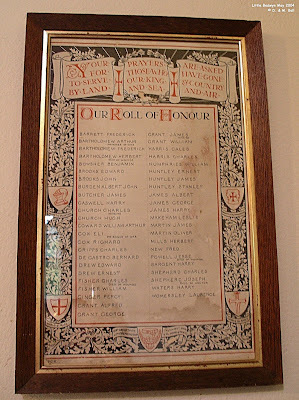 Even though the picture is quite fuzzy, here is the information on the Roll of Honour. Later on during a trawl of the internet I found this picture. I believe this was in the church - but I missed it! 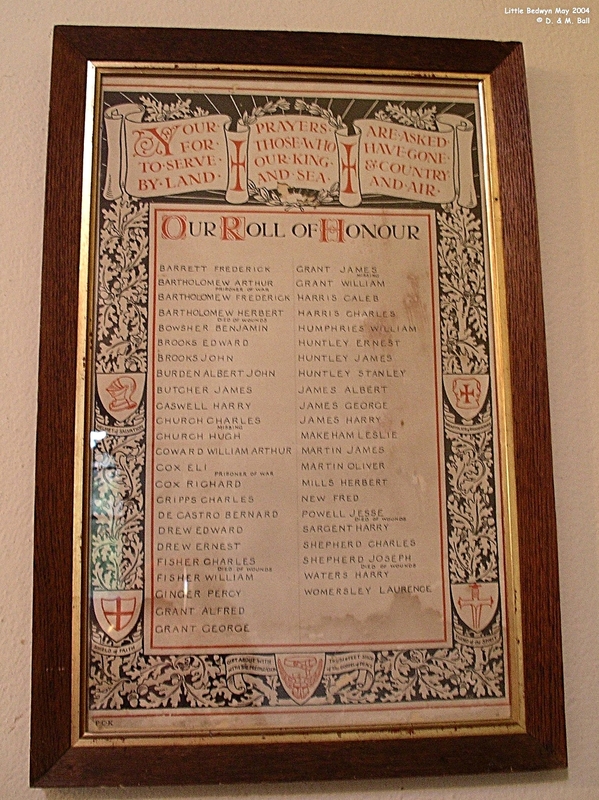 The interesting thing there is a Herbert Mills on this Roll of Honour. It ties this family to Little Bedwyn after all. The inscription is underneath. The surnames are first. Those that did not survive are on the brass plate. My grandmother Rhoda Louise Mills is buried in the cemetry at Little Bedwyn. She married Oliver Henry Martin who was killed on the Somme in 1918. Then remarried to Thomas Bryant.